KLS is pleased to offer crushed gravel and recycled concrete/asphalt. KLS has recently launched our Aggregate division and can now offer our clients with various options for crushed gravel and recycled concrete/asphalt. 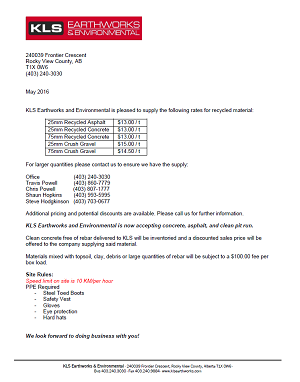 These materials are available for pick-up from our 240039 Frontier Crescent, Rocky View County operations or we would be pleased to provide you with a supply/deliver/place quote for these materials for your site/project. Please click on the pricing table for more information of specifications and pricing. Feel free to contact a KLS representative for a quotation or answer any questions on these or any of our other products and services.